A new report from Environmental Defense Fund and Forest Trends identifies the sources of funding currently available for REDD+ and climate action in forests, and analyzes the challenges and opportunities for accessing and coordinating this finance. Designed to serve as a resource for negotiators, policymakers, practitioners, NGOs, and others involved with the implementation of REDD+ and climate action in forests, the report aims to contribute to scaling up, coordinating, and allocating funding in a timely, efficient, and effective manner. Describes the sources of finance available for each phase of REDD+ —Readiness (Phase 1), Implementation (Phase 2), and Results-based Finance (Phase 3) – and related climate action in forests by detailing each finance source’s: type, mechanism, eligibility requirements, scale, access process, scope, and challenges. Presents information that is both historical and forward looking so as to provide context and inform future decisions when it comes to planning REDD+ implementation and supporting financial strategies combining a diversity of funding sources. The Green Climate Fund, for example, recently announced a pilot program for forest sector results-based payments. Additionally, while not yet an available source of results-based finance, transfer-based payments (TBPs) are a potential source of viable funding for performance based results. Parties in the UNFCCC are currently negotiating internationally transferred mitigation outcomes (ITMOs) as a part of Article 6.2, which will determine the exact nature of TBPs in relation to REDD+. Reveals many challenges with and opportunities for accessing and coordinating finance for REDD+ and climate action in forests at the international and national level. Key challenges identified include minimizing the gap between what is available and what is needed for each REDD+ phase; developing cohesive national visions that can be translated into usable investment plans; allocating funding appropriately according to cross-sectoral and coherent national finance strategies; and aligning requirements and criteria under funding sources for consistency and coherency of requirement processes so to facilitate access and disbursements. Describes the opportunities for both accessing and coordinating finance, which range from exploring viable, complementary sources of market-based REDD+ finance for Phase 3 to redirecting sources of funding for agriculture, for example, to finance REDD+ activities. 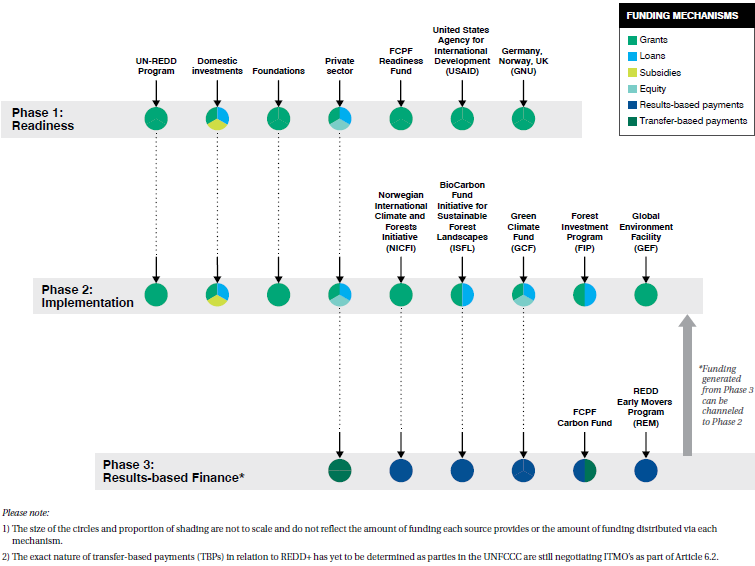 The report also reflects how many finance sources are able to fund multiple phases of REDD+, considering that REDD+ phases often overlap and operate simultaneously, as seen in the infographic below which shows the sources of finance and funding mechanisms for the three phases of REDD+. Such a comprehensive landscape of complementary and/or synergistic sources of funding can contribute to defining efficient and coherent financial strategies for REDD+ design and implementation. The report, produced with support from IUCN as part of ongoing efforts to accelerate action on REDD+ through forest landscape restoration, is timely as the coordination of financial support for REDD+ and climate action in forests will continue to be a top agenda item at the upcoming Bonn intersessional, having featured prominently during COP 23. During the COP, country negotiators – as a continuation of REDD+ focal point meetings held since COP19 – resumed discussions on the coordination of support for the implementation of activities in relation to mitigation actions in the forest sector by developing countries, including institutional and financial arrangements. Negotiators debated the potential need for additional governance arrangements for improving the coordination of support for REDD+ funding and implementation. Additionally, side event and panel participants, country representatives, and others involved with REDD+ and climate action in forests expressed concerns over the availability, sustainability, and coordination of funding for results. Yet, negotiators could not agree on a decision and the co-chairs decided to continue negotiations during the next meetings to be held in May 2018. The report aims to contribute not only to upcoming UNFCCC conversations pertaining to improving access to and coordination of finance for REDD+ and mitigation actions in the forest sector but, by clarifying the challenges with and opportunities for adequately accessing and coordinating funding for REDD+ and climate action in forests, will also contribute to ensuring that funding is made available and disbursed in a timely, efficient, and effective manner. View the report at edf.org/mappingforestfinance. But the research underlying this sensationalistic headline is fundamentally flawed. Not only is their publication factually wrong in many places, but the peer-review process failed to identify numerous weaknesses in the analysis. A rights-based approach for REDD+ was already enshrined in the UNFCCC COP 19’s decision on the Warsaw Framework for REDD+ in 2013. One could argue that it actually goes even further back to the Cancun Safeguard decision at COP 16 in 2010. The biggest problem with CIFOR’s publication is they fail to identify who is murdering indigenous and community leaders trying to protect their rights and forests, which gives the impression that it’s people connected to REDD+. If they would have done more research, they would have found that the majority did not have anything to do with a REDD+ process or rise to an actual “rights abuse” definition. Global Witness documented 200 killings in 2016, and 97 so far in 2017, and identified the biggest violators as mafias involved in illegal logging, mining, and agribusiness – not REDD+ proponents murdering indigenous and community activists. While many of the reviewers are knowledgeable about rights and the REDD+ field, they are not the people who are most well-acquainted with UNFCCC REDD+ decisions. REDD+ negotiators, indigenous peoples representatives, and civil society organizations spent eight years creating comprehensive guidance for REDD+, called the Warsaw Framework for REDD+. The Warsaw Framework includes the “Cancun Safeguards” and also mandates reporting on how the safeguards are addressed and respected. The Cancun Safeguards were agreed to in 2010 and were one of the first REDD+ decisions that guided all subsequent decisions. The Cancun Safeguards was one of the first decisions to reference the United Nations Declaration on the Rights of Indigenous Peoples (also known as “UNDRIP”) in an international agreement. Nearly all of the world’s countries approved the decision and the insertion of a reference to UNDRIP forced many countries who had not previously acknowledged the Declaration to do as much. A significant part of the “allegations” and “potential” negative examples explored in the article are linked to REDD+ projects, which again, are not covered by the Warsaw Framework for REDD+. But do a simple word search for “projects” in all of the UNFCCC REDD+ decisions and you’ll see the word does not appear once. That’s because implicitly, UNFCCC REDD+ is meant for jurisdictional REDD+ programs – not one-off REDD+ projects. CIFOR and the REDD+ community should consider a few steps to make amends for their inaccurate publication. CIFOR should consider writing its own research paper on the dozens, if not hundreds, of indigenous leaders and forest activists that are murdered every year defending their rights and the forests. CIFOR should not treat REDD Monitor as a legitimate resource for academic research. Vigilance will always be needed to ensure that no abuses of indigenous rights occur in the context of REDD+ readiness and implementation. One such violation is one too many. However, such risks have long been identified and are already being addressed, not least because indigenous groups have effectively used national and international REDD+ processes to advance recognition of their rights. Sensationalized publications based on unsubstantiated allegations do nobody any good, and divert attention from documented rights violations and murders committed by actors seeking to destroy forests – not by REDD+ proponents who are eager to work with indigenous leaders to protect them. Part II: Amazon Hydroelectrics, the UN Climate Treaty and the International Civil Aviation Organization (ICAO) – will greed and corruption derail the international climate negotiations? Brazil’s climate change negotiators are trying to throw the best hope for at-scale finance for stopping deforestation under the bus to ensure a big payday for bogus carbon credits from Amazon dams and other Clean Development Mechanism (CDM) projects — benefitting the scandal-plagued national power company Eletrobrás at the expense of the Amazon. (See EDF and Brazilian partners report.) There are far better ways to combat climate change. One of the best examples of how to do it, ironically, is what Brazil and Amazon states have actually done in reducing Amazon deforestation since 2004. Government ramped up enforcement, recognized indigenous territories and protected forests for other communities, and consumer goods companies like Walmart told their suppliers they needed zero-deforestation commodities. The result was a 70% reduction in deforestation by 2016 that kept 3.65 billion tons CO₂ out of the atmosphere – on the order of what the European Union achieved, only in one developing country. But positive incentives for forest protection called for repeatedly in legislation never materialized, so pushback from the big ranchers’ and farmers’ caucus in the Congress has put all of these gains at serious risk, and deforestation started to tick up again. There is a lot at stake here, for the atmosphere as well as the forest. New research shows that much more cost effective climate change mitigation than anyone suspected – 11 billion tons of CO2 per year till 2030 — can come from “natural climate solutions”, mostly from stopping tropical deforestation and forest degradation. This is almost 40% of the mitigation needed by 2030 to have a 66% or better chance of keeping warming below 2°C, according to the authors. Bringing jurisdictional reductions in deforestation and forest degradation into carbon markets could generate the funds that Brazil needs to end Amazon deforestation and effect the transformation to low-carbon sustainable agriculture. Reducing and ultimately stopping large-scale deforestation is fully feasible. We know this because Brazil and the Amazon states have done it. 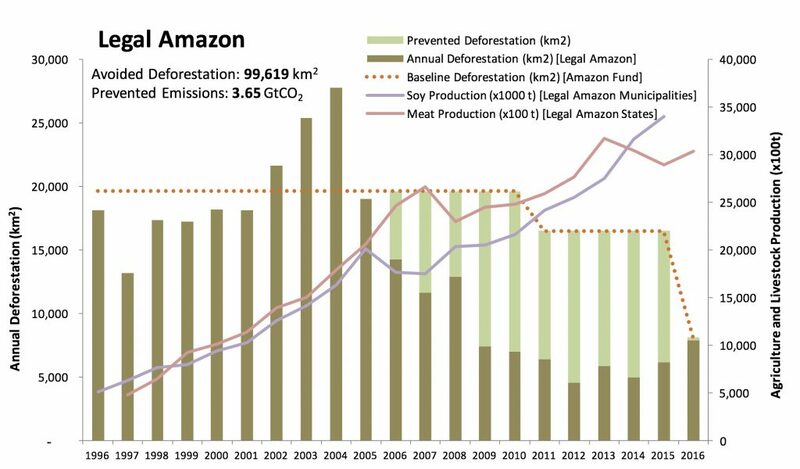 They have taken reductions targets below historical levels, and made world-leading reductions while increasing cattle and soy production – historically the major drivers of deforestation (Figure 1). Making emissions reductions at the scale of a state or region or country is much more like the EU or California cap-and-trade systems than an offset project. It’s actually systemic climate change mitigation. Bringing jurisdictional reductions in deforestation and forest degradation into carbon markets could generate the funds that Brazil needs to end Amazon deforestation and effect the transformation to low-carbon sustainable agriculture. Transparent accounting, rigorous double-entry bookkeeping to avoid double counting, and fair benefit sharing will be critical to making it work, but are also completely feasible. Doing sustained, large-scale deforestation reduction would also allow Brazil to call for more ambitious goals for other big emitter countries, and create cost-effective opportunities to make that happen. A revamped CDM could then channel funds to the least developed countries that most need them. Figure 1. Brazil annual Amazon deforestation, soy and cattle production 1996 – 2016 (source: Stabile, M. 2017. Amazon Environmental Research Institute (IPAM); Brazil National Space Research Institute – INPE/PRODES; Brazilian Geographical and Statistical Institute – IBGE PPM and PAM, Amazon Fund. So why wouldn’t any country with a lot of forest to protect, and potentially a lot to gain from it, want to continue a winning streak? Well, as Brazil’s experience shows, there’s a lot less opportunity for corruption in reducing deforestation than there is in, say, building dams. Carbon credit for Amazon dams fits right in with the massive corruption, “Operation Car Wash”, super-sketchy side of Brazil. World-leading emissions reductions from controlling Amazon deforestation are an example what we could call the Chico Mendes side of the country. Brazil has always had these two sides. Corruption is endemic but so is innovative public policy. Brazil’s world-class AIDs program, which has kept infection rates far below other early hotspots; the sugar cane ethanol program that gave Brazil the biggest flex-fuel automotive fleet in the world; internationally recognized high-tech remote sensing monitoring of deforestation; and former President Lula’s poverty reduction programs are all examples. Brazil has an exceptional opportunity to become an economic/environmental innovator and global leader of truly transformative impact – a 21st century environmental/economic superpower — if it succeeds in creating real economic value for living forests. What Acre Governor Tião Viana calls “the low-carbon, high social equity economy” shows the way to zero deforestation, sustainable commodity and family farmer agriculture, and sustainable, prosperous forest communities. Which side of Brazil’s Jekyll-Hyde political character will win? When Chico Mendes was alive, most people would have probably picked the Car Wash side. Along with ever-increasing numbers of Brazilians, I’d pick Chico’s side. Both sides are on display at the international climate negotiations, where Brazilian negotiators are pushing hard for deeply flawed CDM projects including Eletrobrás’s Amazon dam boondoggles. Which side wins won’t only affect Brazilians. It will make a real difference to the atmosphere, and to us. Brazil’s climate policy theater: Brazil climate negotiators fight for carbon credit payout for scandal-plagued national power company Eletrobrás and Amazon mega-hydroelectrics, block carbon finance for ending Amazon deforestation. Behind the headline-grabbing news about Brazilian political corruption, Brazilian climate change negotiators are busy pushing proposals that could seriously damage important new climate change agreements – and shut the door on much-needed finance for stopping deforestation. New market mechanisms in the UN Paris Agreement and in the International Civil Aviation Organization’s Carbon Offsetting and Reduction Scheme for Civil Aviation (CORSIA) could provide money Brazil needs to protect its rainforest, including protecting heavily threatened indigenous territories twice the size of California. The new mechanisms could also help other tropical countries stop deforestation. That would be great news for the global atmosphere and for the people who live in the forests. But Brazil’s negotiators are dead set against it. Instead, they’re fighting hard to preserve the Clean Development Mechanism (CDM), a relic of the Kyoto Protocol. Global climate change champions California and the European Union have largely or entirely shut the CDM out of their markets because they’ve concluded, rightfully, that its claims to environmental integrity have lost credibility. Brazilian negotiators say the CDM is the gold standard for environmental quality, and reducing deforestation is too risky for carbon credit. A new report by EDF and Brazilian partners – along with a plethora of other analyses — reaches a different conclusion. The CDM was created in 1997 by the Kyoto Protocol to allow emissions reductions projects in developing countries to generate tradeable carbon credits, called “Certified Emissions Reductions” (CERs), which, the Protocol specifies, could be used by industrialized countries to help meet their emissions targetsduring the years 2008-2012. But since new targets for these countries didn’t take effect under the Kyoto Protocol, CER prices plummeted for lack of buyers. Brazil has a big portfolio of projects that are generating currently zero-value CERs that could turn into real money if the new market mechanisms of the Paris Agreement and CORSIA accept CDM credits. No wonder they like the CDM. Three Amazon dams – Santo Antônio, Jirau and Teles Pires – are Brazil’s biggest CDM projects, and say a lot about what’s wrong with the mechanism. Starting in 2012 affiliates of Brazil’s state power company, Eletrobrás, registered the mega-hydroelectric dams in the Amazon as CDM projects. They said that the dams would reduce greenhouse gas emissions that would have otherwise happened, and that since they were big, risky projects, they wouldn’t be financially viable unless they got the carbon credit. The CDM approved the dams, issued millions of CERs for them, and stands ready to issue hundreds of millions more. But, a little later, these dams were implicated in the “Operation Car Wash” investigation, probably the largest corruption investigation in the world. The investigation first uncovered bid rigging, bribery and kickbacks worth billions of dollars in state oil company Petrobrás. It has now convicted scores of politicians and top executives at Brazil’s biggest companies. Eletrobrás executives engaged in exactly the same schemes in the three Amazon dams and other projects, according to whistleblowers. One former officer of an Eletrobrás subsidiary has been sentenced to more than forty years in prison for bribery, money laundering, obstruction of justice, tax evasion, and participation in a criminal organization, and similar charges are pending against others. 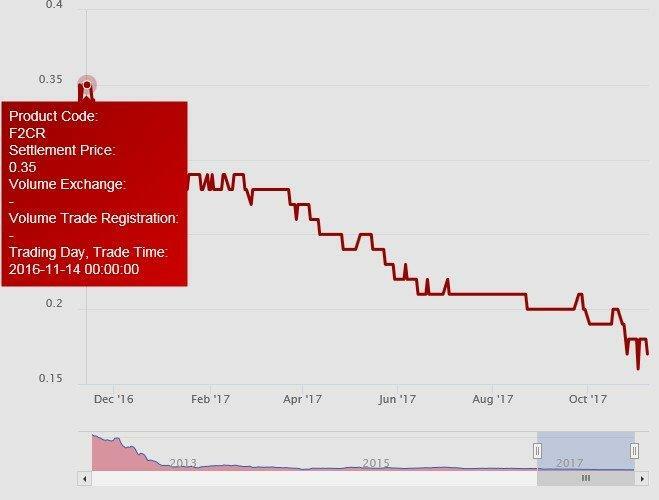 Eletrobrás’s stock price crashed as a result. US investors brought suit against the company, now pending in federal court in New York. They allege that Eletrobrás publicly claimed it was keeping clean books and building legitimate energy projects, while in fact concealing massive corruption and kickbacks. The dams ran up billions in cost overruns (allegedly to pay the bribes and kickbacks) at the investors’ expense. Meanwhile, while it told the CDM that carbon finance was crucial for the dams to go forward, the company went ahead and built the dams. The dams are operating today with basically zero carbon finance, because the CERs became virtually worthless after the end-of-2012 the price crash. If the dams in fact caused any emissions reductions, they did it without money from the CERs – so they would have happened anyway. But, in fact the dams never caused any emissions reductions – the decision to build them was political, not economic. Opportunities for bribes and kickbacks were by all indications a key factor. It’s not surprising Eletrobrás and affiliates never told its investors that it needed carbon credit for the dams to pay off – the credits were just icing on the cake. That the CDM approved the dam projects at all is a serious indictment of its rules. Lots of other analyses have concluded that this mechanism needs serious overhaul or phase-out. See my next post for a better approach to international collaboration on climate change mitigation.